You already have a Facebook page for your architecture or construction firm and you want to make it even more effective? Good – we’d like to offer you some easy user tips and functionalities. Facebook makes it easy to switch between your pages: in the right top menu item you have the option to select that you wish to use your Facebook as your business page. It is also possible to react to other pages, using your business page. A handy solution to keep your personal profile separated from your business page. 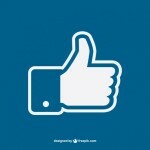 If you use your Facebook from your business page, you can also ‘like’ other pages by pressing the ‘Like’ button. This was not possible in the past, so people who have had a business page for a longer period of time, may very well not know about this function yet! Using your business page, you can also post messages on the board of pages that you like, or you can react to shared messages/pictures/videos. Beware: As a page, you cannot place messages yourself on personal profiles. This has been set up like this by Facebook to prevent spamming from businesses. As a business page, you can only post messages on other business pages. Make sure that your business page contains sufficient information about your organization. Remember to put in the story about your company, a description of products and services, contact information and a link to your website. You might also want to fill in sections that allow you to record the history and progress of your business — like the day/year your company was founded, or when you hosted major events. Also make sure that you make a link on your personal profile to your business page. That makes it easy for people to find your business page. 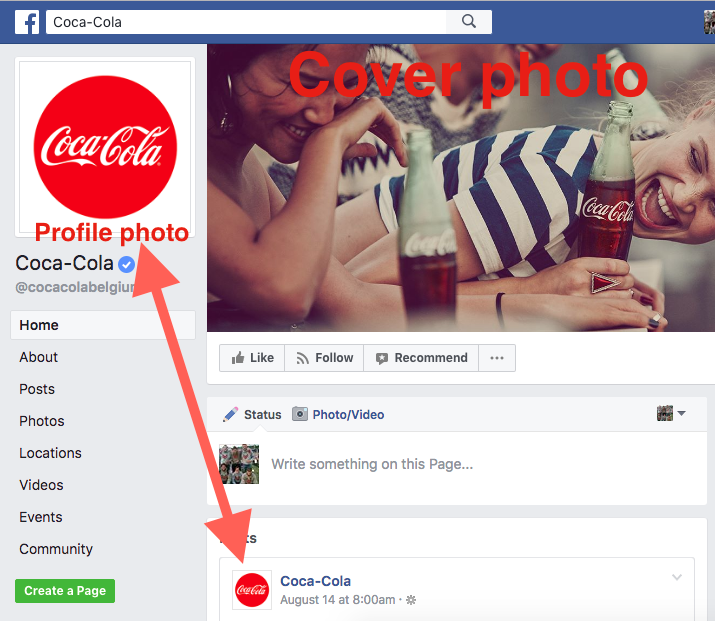 Your profile picture is a very important part of your business page (just like your cover picture, by the way, because that is the first, and hopefully good, impression of your company). Your profile picture appears under the cover image and in a miniature version next to the updates that you post. So, make sure that you choose a recognisable profile picture. You could possibly use the picture of your logo for that purpose. Also, double-check to see that your profile picture is still clear in a miniature version. Also make sure to choose an engaging cover photo, since this is the one that takes up most of the header space of your Facebook page. Social networks are all about conversations. Ask questions from your followers and react to posted reactions. 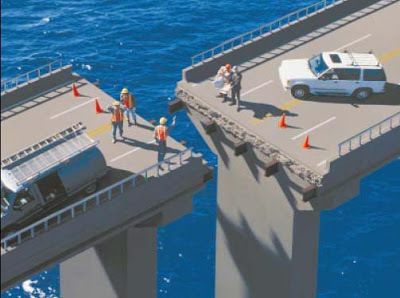 This shows your involvement and this way you create involvement. Of course, it is great if your page has followers. But that should not be the goal in itself. It doesn’t help you at all if you have a fan who is just a fan. You want people who are interested in your company. Holding a raffle may certainly create followers, but make sure you stay close to your business. So, don’t choose an iPad as your prize, but offer interior advice, or stucco a wall for free, a floor laid for free, a free mounted system ceiling, etc. Do not just post your message in text. Visual content has pretty much become a requirement of any online presence, including social media channels. After all, it’s 40X more likely to get shared on social media than other types of content. Also, in a recent video released by Facebook, Facebook confirmed that Facebook users find video 5 times more engaging than images. Take care that you are consistent and place updates on a regular basis. But don’t do this in excess. In order to make sure that you publish consistently, you could use e.g. Hootsuite or Buffer to plan your messages. This way you can maintain an overview and variation in your updates. Publish more than just the latest news about your organization or the branch. Think about what your followers might want to read. People are fans of pages where they receive more, rather than of those pages that don’t offer a lot. Take another look at pages of colleague entrepreneurs to find inspiration. Pin important posts to the top of your page. Business pages now have the option to pin the most important posts posts at the top of their pages. 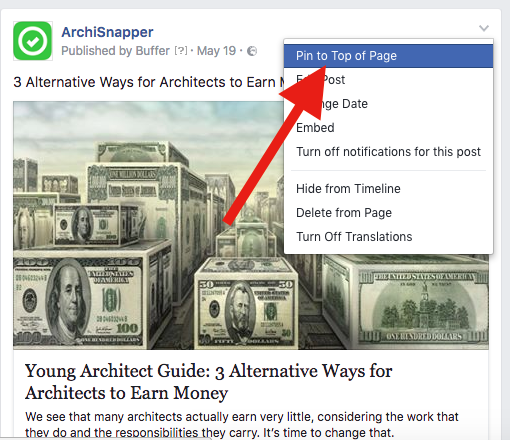 This feature allows page admins to prioritize a particular page post by pinning them on top of the page. It will be the first update that fans can view at the top of your page. To pin a post, click on the drop-down arrow in the top-right corner of a post on your page, and click ‘Pin to Top.’ It will then appear at the top of your page, flagged with a little bookmark. Just keep in mind that you can only have one pinned post at any given time. 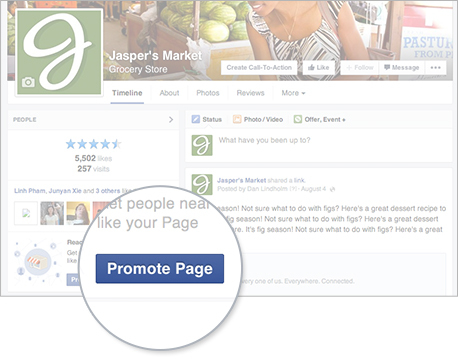 One of the first things you can do is to create an ad promoting your Page. Find out here what are the steps to do this. And advantage of Facebook Ads is that you can target people based on locations, interests, and age and gender. 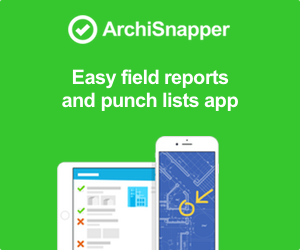 ← Simple App for HVAC Installers to Save Time with Site Follow-up and Punch Lists.